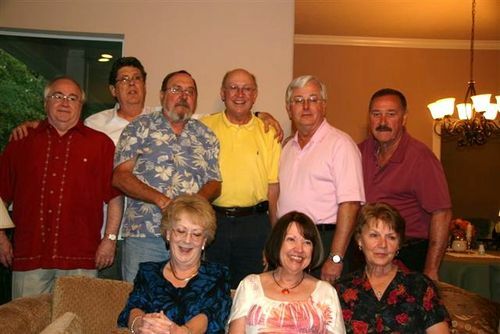 Here are 9 members of the Milby 1960 Reunion Committee who met on April 19th, 2009 at Linda (Hocher) and Tommy Bennett's gorgeous new home in the woods north of Houston, in Huffman, Texas. One year before the reunion actually took place! Left to right, back row: Larry Pyle, Ray Prichard, Jeff Powers, Donald Williamson, Guy Mason, and Joe Forrester. Front Row , left to right: Linda HOCHER Bennett, Alma WOODWARD Powers, and Fonda WHITT Forrester. Not pictured, but present in the spirit of support, were Melba EVANS Ainsworth, Doris LENTZ Simmons, and Judee UTGARD Schroeder.